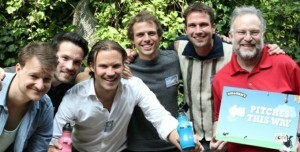 Last Week FairMail learned it made it to the finals of Ben & Jerry’s Join Our Core Competition. Ben & Jerry’s are on the hunt for some bright sparks in the UK, Ireland, Denmark, Sweden & the Netherlands, who are creating cool new models for sustainable business which will help make a difference in communities. To decide who would go through to the finals 25 social entrepreneurs from 5 countries had to pitch for a panel of judges in the “Dragon’s Den” studio in London on Wednesday the 23rd of May. 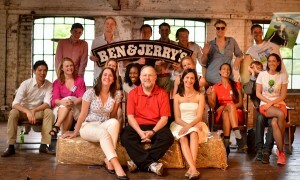 Ben & Jerry’s founder Jerry Greenfield was amongst the judges just like Dutch astronaut Wubbo Ockels. That same evening the judges announced that FairMail was one of the 15 finalists battling for the final victory during a 10 day mission in Uganda in August. There FairMail founder Peter Den Hond will have to work alongside young local social entrepreneurs trying to diversify the income of the farming members of the local fair trade vanilla cooperative that is used to make Ben & Jerry’s delicious ice cream. If FairMail wins it not only means a 10.000 euro cheque to invest in FairMail, but also mentioning of FairMail’s name and logo on Ben & Jerry’s ice cream tubs plus 6 months mentoring by Ashoka. The final result will be on the 22nd of August 2012. There is also a People’s voting competition. With your vote you can help FairMail win an additional 1.000 euro prize to invest in the setting up of FairMail Morocco. Just click here to cast you vote. Thank you so much!